Idomeneo is a rare example of a tenor role with no love interest. However, Mozart more than makes up for it by giving the eponymous King of Crete one of the greatest virtuoso arias in the tenor repertory, 'Fuor del mar', and through his moving musical representation of Idomeneo's struggle to reconcile paternal love and religious duty. Arnold famously led to the birth of the ‘modern tenor’, when an early interpreter, Gilbert Duprez, sang the high C in the Act IV cabaletta ‘Amis, amis’ in full voice rather than the customary falsetto. From the flamboyance of this stirring cabaletta to the lyricism of Arnold’s Act II duet with his beloved Mathilde and his mournful Act IV aria ‘Asile héréditaire’, there are plenty of vocal delights for any tenor bold enough to take on the challenge. Luciano Pavarotti described the role of the heroic monarchist Arturo, caught between love and political duty during England’s Civil War, as ‘pure tightrope walking’. Particularly demanding episodes include the Act I aria ‘A te, o cara’ and the Act III ensemble ‘Credeasi misera’, in which the courageous Arturo has to sing some of the highest notes ever written for tenor. Stamina and versatility are the key skills for interpreters of Berlioz’s Trojan hero. Aeneas bursts onto the stage in Act I with high, declamatory music – but the role also calls for a singer capable of delicate lyricism, particularly in the sublime Act IV duet with Dido, ‘Nuit d’ivresse’. Keeping back enough energy for Act V’s heroic and despairing aria ‘Inutile regrets’, with its huge vocal range, is also crucial. Wagner’s Siegfried is arguably the hardest role in the dramatic tenor repertory. Episodes such as the Forging Song require immense vocal power, easy top notes and boundless energy. But it’s not all about decibels: the singer also has to convince as the tender, sympathetic lover of Act III of Siegfried and of Götterdämmerung’s death scene. Most importantly, he needs the stamina to keep going throughout two five-hour operas and still sound fresh at the end! Otello is perhaps Verdi’s most challenging tenor role. It requires a wide vocal range, and the singer needs to project over a powerful orchestra. Otello also presents a host of dramatic challenges: his interpreter must convince as Act I’s heroic commander, and as the troubled, ultimately broken man of the later acts – and remain sympathetic despite his appalling actions. The role of Gherman not only requires a singer of great stamina – he’s rarely offstage – but also one with the acting skills to convey the character’s mental instability and obsessiveness, while making us sympathize with him in his love for Liza and his loneliness. The rewards for the tenor are great, though: Plácido Domingo described Gherman as ‘dramatically one of the most interesting characters I have ever played’. Rodolfo is a character that many singers find it easy to empathize with: his enthusiasm for life, youthful romantic passion and fun-loving, humorous streak. The role also contains much glorious music, including ‘Che gelida manina’, one of opera’s most beautiful lyric tenor arias. No wonder that great tenors including Enrico Caruso, José Carreras and Pavarotti have listed Rodolfo among their favourite roles. Strauss never gave tenors an easy time of it, and the Emperor outdoes even the role of Bacchus from Ariadne auf Naxos in its vocal difficulty. He makes his first appearance with a heroic aria set fiendishly high in the voice, and further challenges await in Act II when he sings a 12-minute monologue of almost unbearable intensity. Fortunately, the music is as consistently glorious as it is difficult! Peter Grimes’s ambivalent nature makes him one of opera’s most dramatically interesting roles. Is he a hero or a villain? A murderer or a visionary? And how much should we sympathize with him? Jon Vickers saw him as a Christ-like figure, Anthony Rolfe-Johnson as ‘a dangerous, violent, quixotic and very valuable person for whom things go wrong’. But whoever Grimes is, there’s no doubting his wonderful music, including the Act I aria ‘Now the Great Bear and Pleiades’. Otello ran 21 June–15 July 2017 and was broadcast live to cinemas around the world on 28 June 2017. The production is generously supported by Rolex and is given with generous philanthropic support from Mrs Aline Foriel-Destezet, Mrs Susan A. Olde OBE, Alfiya and Timur Kuanyshev, Lord and Lady Laidlaw, Mr and Mrs Baha Bassatne, John G. Turner and Jerry G. Fischer, Ian and Helen Andrews, Mercedes T. Bass, Maggie Copus, Martin and Jane Houston, Mrs Trevor Swete, Beth Madison, John McGinn and Cary Davis, the Otello Production Syndicate, The American Friends of Covent Garden, The Royal Opera House Endowment Fund and an anonymous donor. 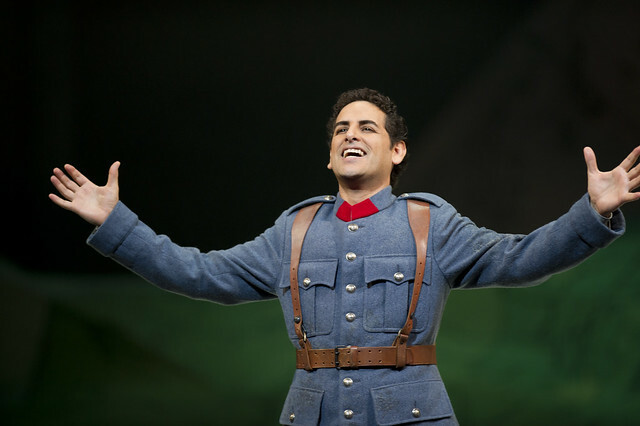 How very odd to illustrate this piece with a photo of Juan Diego Florez as Tonio in Donizetti's La Fille du Regiment and then not include this in your list of ten roles - or am I missing something? You're quite right, this role isn't one of the ones on the list. The idea behind the image was to use a suitably triumphant, recognisable photo of a tenor role until we have photos of the upcoming production of Otello - which, of course, we won't be releasing until after it opens this evening. Here is the elephant in the room. Tenors are, with rare exception, the great sissies of ill-considered bravado in the opera world. Do you honestly prefer Siegfried to Wotan? Duprez did not create the role of Arnold in "Guillaume Tell" - it was Adolphe Nourrit. Many thanks for flagging this error, which we've now corrected. I'd add Nemorino in L'Elisir d'Amore. Bergonzi was unforgettably brilliant in the role. There are many great roles and great operas that can't be condensed or summarised into a list of 10, but you simply look at the impact that each role has had on audiences (eg introducing audiences or even future singers and composers to the art form), Cavaradossi, Don Jose and Calaf should be in there before Arnold, Siegfried and the Emperor get a look in. It's not that the other roles are bad but simply the fact that those have had a greater impact in recent opera performing and listening. If this means Puccini appears to hog the list with 3 roles- well, he certainly deserves it as his operas have played a part in popularising opera, getting larger audiences for opera and bringing more revenue in for opera, and he is definitely the opera specialist among all composers. It is invidious and difficult to condense to 10 but could I put in a plea forvthebgreat Jon. Ickers as Florestan in Fidelio at ROH in the 70s! I agree but surely you should also mention Acts 1 and 2, particularly when Act 2 is performed complete. May I suggest you add Tonio in La Fille du Regiment to your list of tenor roles, then? It is the only one with 9 high Cs, after all! My list would include two tenor roles that are arguably the principle role despite each opera's name: Calaf in Turandot and Captain Vere in Billy Budd. I know you are English, but speak about Benjamin Britten when you forgot Faust, Werther, Tannhaüser, Lohengrin, Ricardo, Radamés!!! I would certainly suggest Werther should be on the list - a role that is deeply moving for the audience as well as, I believe, for the singer. There is mention above of changing the photo of JDF for one from your recent Otello production; isn't it time you did ? That was a tremendous performance by Jonas Kaufmann. For me Otello is Verdi at his best and no one past or present and probably future can come close to the performance of Placido Domingo! Missing are Paul (Korngold), Tannhauser (Wagner), Tristan (Wagner) and Guntram (R. Strauss). “Mes Amis, écoutez l’histoire” - Adam, surely!! Remember a young Cosmin Ifrim singing this in Cardiff some years ago. Magical.